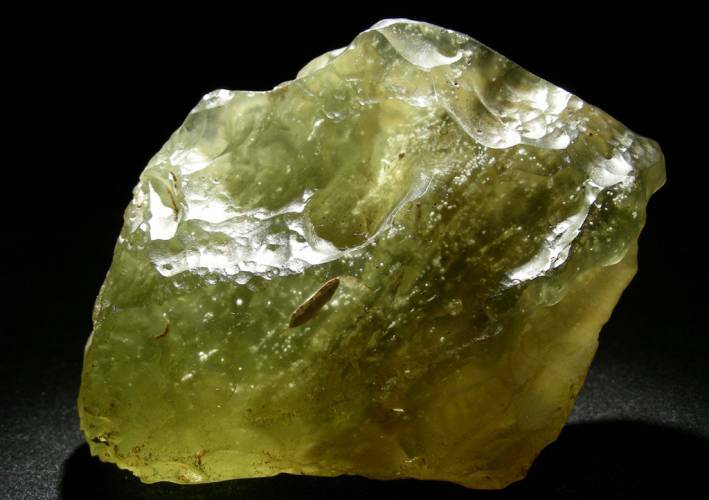 The strewn field of the Libyan Desert Glass (LDG) is located in the Western Desert of Egypt nearby the Libyan border (part of the Great Sand Sea). 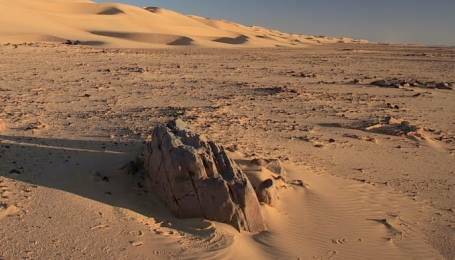 The area is occupies with high parallel sand dunes, which extend from north to south direction more as hundred kilometers in length. As centre is assumed an area, which is expands about 20 km from W to E and about 50 km from N to S around the position at 25° 25' N and 25° 30' E. The occurrence of silica-glass was documented for the first time by Patrick A. Clayton in 1932. It is supposed, that on a plain of about 6500 km2 a mass of ~1400 tons of LDG is distributed. 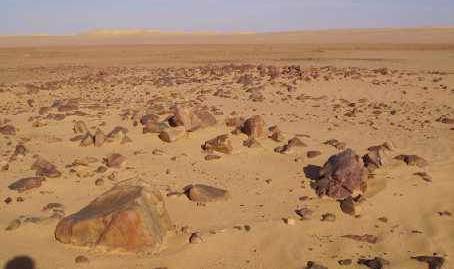 The most productive locations therefore are directly in the north of Gilf Kebir plateau. 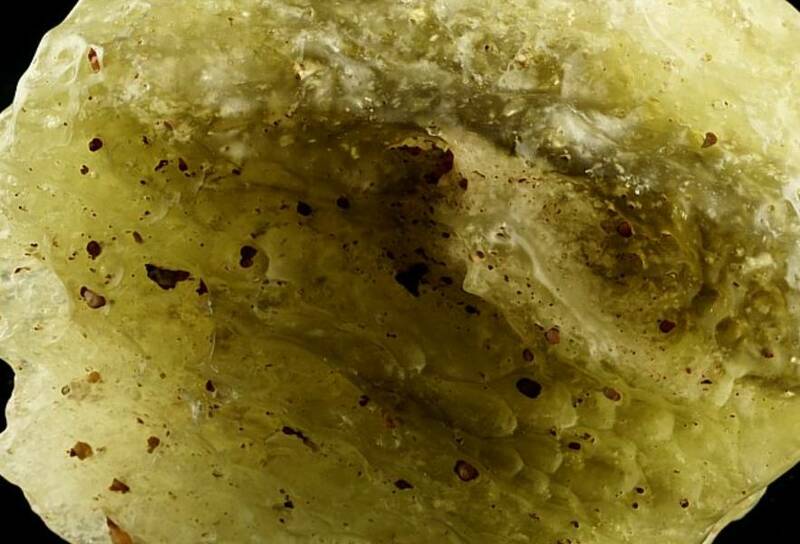 The Libyan Desert Glass (LDG) is in its chemical and physical characteristics absolutely unique and with no other natural glass comparable (volcanic glass, Tektites and impact glass). Nevertheless should be evidences for an impact origin the presence of schlieren and partly digested mineral phases, and Lechatelierite (a high-temperature mineral melts of quartz, however at slight pressure), and Baddeleyite, a high-temperature breakdown product of Zircon. But the so characteristic inclusions of small crystals of alpha-Tridymite and alpha-Cristobalite are missing in impact glasses. Also typical for tektite are spherical or drops - formed aerodynamic forms. There are however also differences between the LDG and the "classical" impact glasses, mainly by the chemistry. LDG is a very silica-rich natural glass with about 95.5 - 99 wt.% SiO2, and shows a limited variation in major and trace element abundances. The degree of hardness (MOHS) is 6, the specific weight is 2.2 g/cm3, the refractive index is 1.46. The viscosity is essentially greater than at tektites. The melting point is with 1727-1713° C more as 500° higher, than which other natural glasses. 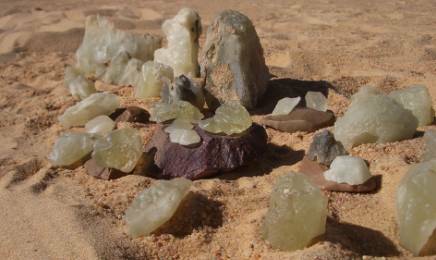 The Desert Glass differs from the Tektites also by higher capacity of water inclusions (0.050 - 0.200 wt.%). The colours of the LDG's varies from light-yellow, honey-yellow, green-yellow, milky-white to black-grey. 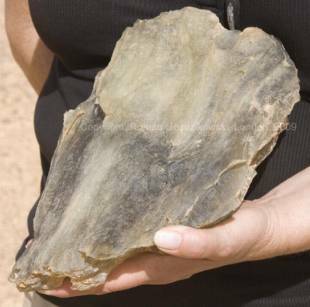 At the surface deposited fragments are polished often by the wind erosion, in sediment sticking fragments have sharp corners, are not gleaming, and sand grains are stuck. 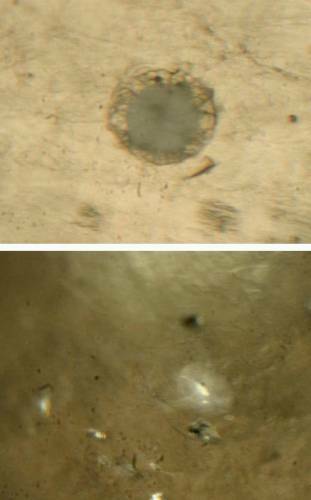 In macroscopic examination, the glass shows no impact tracks (JUX,1983), in some fragments are however schlieren, which point to internal movements in the material at high temperatures.Tiny, irregularly formed bubbles, and light- and dark-brown bands can enforce the homogeneous glassy mass. 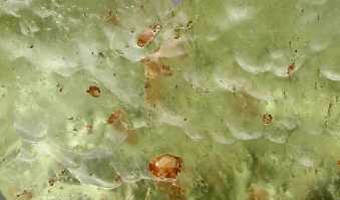 Is the concentration of bubbles high, the Desert Glass appears milky - white and is opaque. Beside the bubbles different kinds of further inclusions are to be recognized. To this (e.g.) 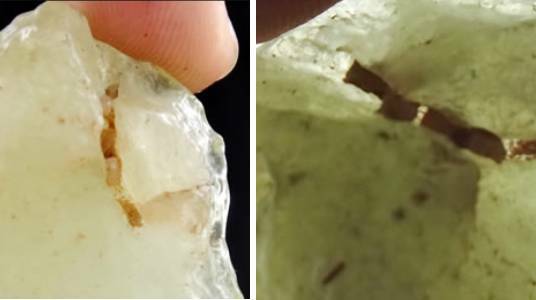 belong smallest crystal-grains of quartz similar minerals alpha-Tridymite and alpha-Cristobalite. MURALI et al. 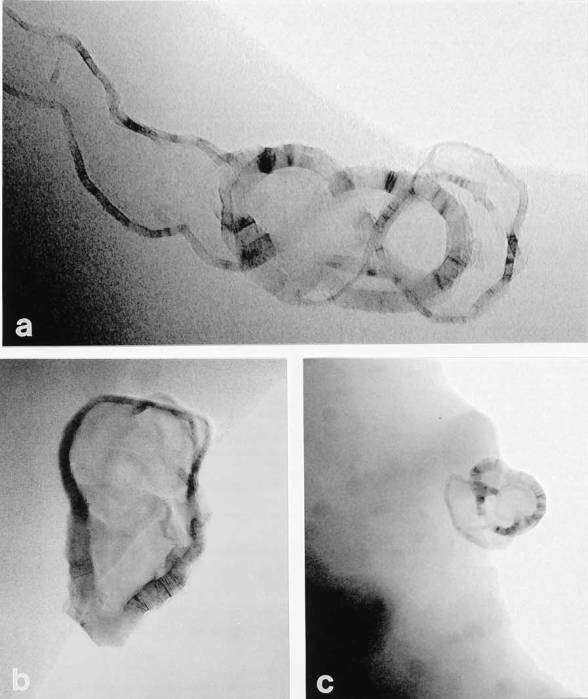 1997; ROCCHIA et al. 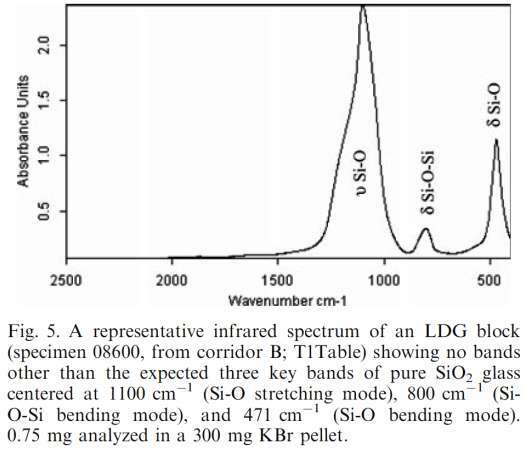 1996; KOEBERL 1997 have found that the contents of siderophile elements, such as Co, Ni and Ir, are significantly enriched in some rare, dark bands that occur in some LDG samples. KOEBERL (1997) studied such dark bands and found that the contents of Fe, Mg, and Ni are high in the dark zones and low in the "normal" LDG. TEM investigation of the dark streaks (PRATESI et al. 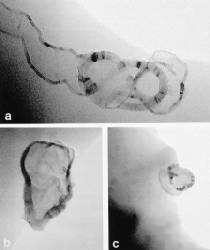 2002) also revealed the presence of small amorphous Fe-rich silicate spherules, within the silica-glass matrix, resulting from silicate-silicate liquid immiscibility. Inclusions of gas bubbles and a drop of dark glass. Stalks or graphite ribbons ? The origin of the LDG is up to now unsolved despite all efforts. The majority of specialists favor an origin by an impact. There are however some differences to "classical" impact glasses. There is also no credible references for an impact event in the region. It is also not plausible, that a mass of ~1400 tons of clean glass is produced by an impact event (or an air burst). It is not conceivable, that for a so great quantity of LDG an ground-reservoir of pure silicium-sand was available, which then was melted by an extra-terrestrial event. 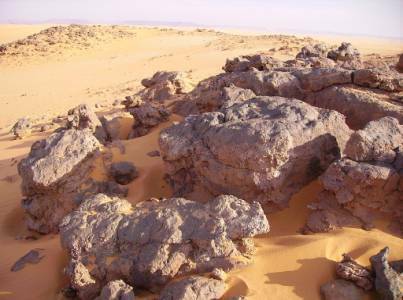 Besides the desert not exist in the Oligocene age. 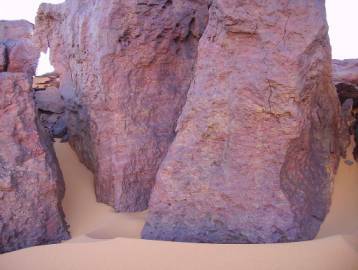 The surface was dominated by consolidated "Nubian"sandstones. It is therefore not to be doubted that the LDG was caused by a purely terrestrial event. Meanwhile, there is enough geological and geochemical evidence for it. An exterrestrial origin (impact or airburst) is excluded, it is nonsense. 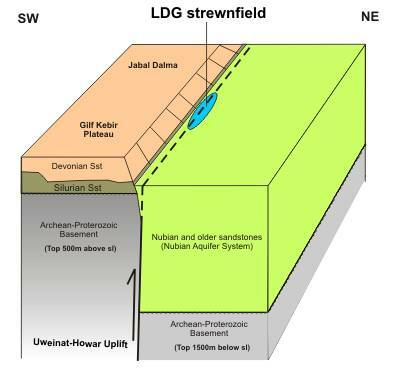 The LDG strewnfield is located on a SW-NE fault line, where a large block of the Archean-Proterozoic Basement were uplifted about 2000 m above its original level to the present terrain surface (Uweinat-Howar Uplift). 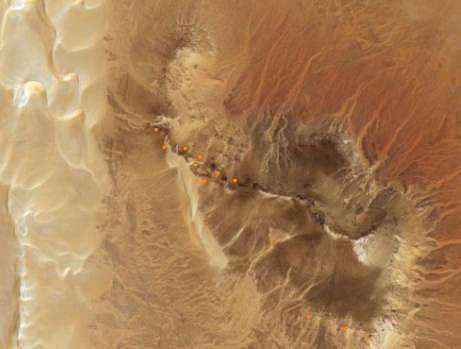 The entire region is characterized by intense sub-volcanic activities, during which hundreds of crater-like structures, plugs and dykes have been created. The Oligocene age of these structures, some of which are visibly associated with basaltic intrusions, is conform to that of LDG. In the meantime, unique boulders of magnetic Silica rocks have been found south of the Silica strewnfield containing magnetite and inclusions in the form of high temperature quartz drops (tridymite). The findings of "sub-micrometer diamonds in an amorphous, carbon-dominated matrix" in LDG are a clear indication for the origin of the glass melt from enormous depths. 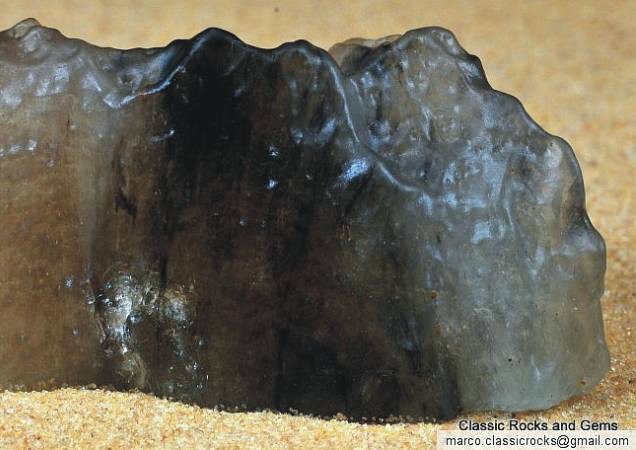 Also remarkable is the detection of many small diamonds in breccias that were found in the Silica strewnfield. The findings of "sub-micrometer diamonds in an amorphous, carbon-dominated matrix" in LDG itself are a clear indication for the origin of the glass melt from enormous depths. 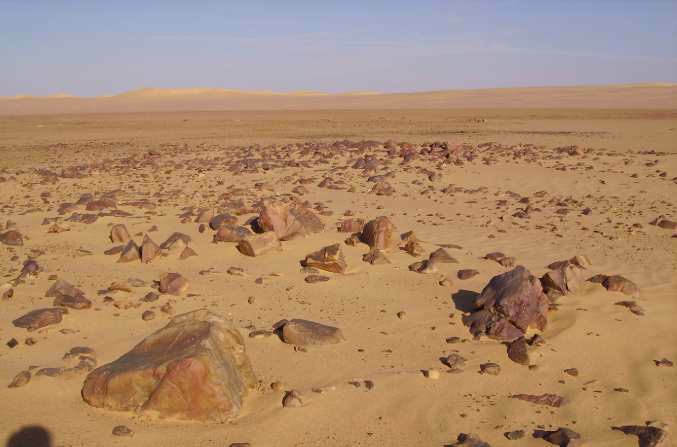 In this context include the extraordinary stone "Hypatia" (carbonaceous, diamond-bearing stone), as well as the polymetallic and carbonaceous debris in paleosol, which were found in the LDG strewn field, nearby the uplift-main-fault. 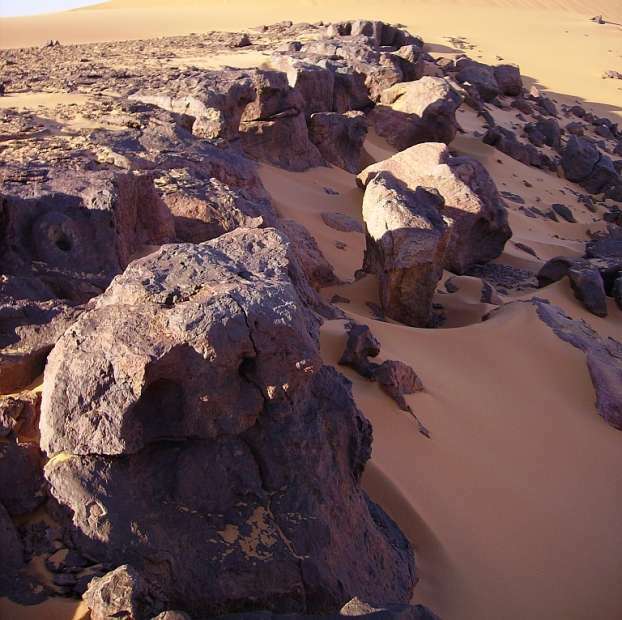 Sensational is the detection of altered Al-rich orthopyroxenes in the LDG, which document a connection to a magma. The iridium and other rare elements contained in the glass are no problem. On the contrary, they support the obvious source of the molten glass from the Earth's crust or deeper. In addition to the entire spectrum of different quartz crystallization, further inclusions and dark zones (accumulation of metals) can be find, which, due to their texture, document a flow of the silica mass. 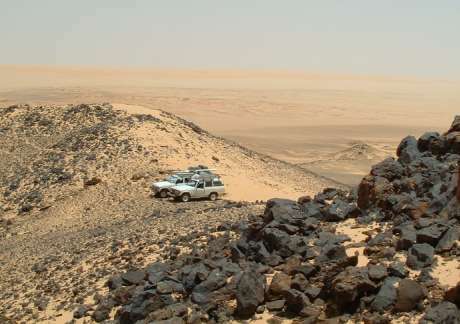 A tremendous sensation is the discovery of a kimberlite breccia from a crater-like structure in the western direction of the strewnfield containing perhaps diamonds at the surface. 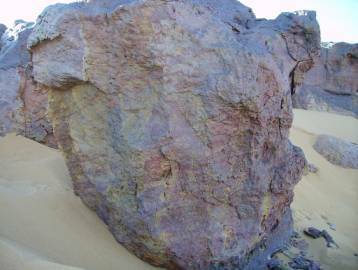 Proved, however, are large dark brown diamonds in a breccia of the structure Qaret-el-Hanash in the immediate south-southeast of the strewnfield field, which would have to be a kimberlite pipe. 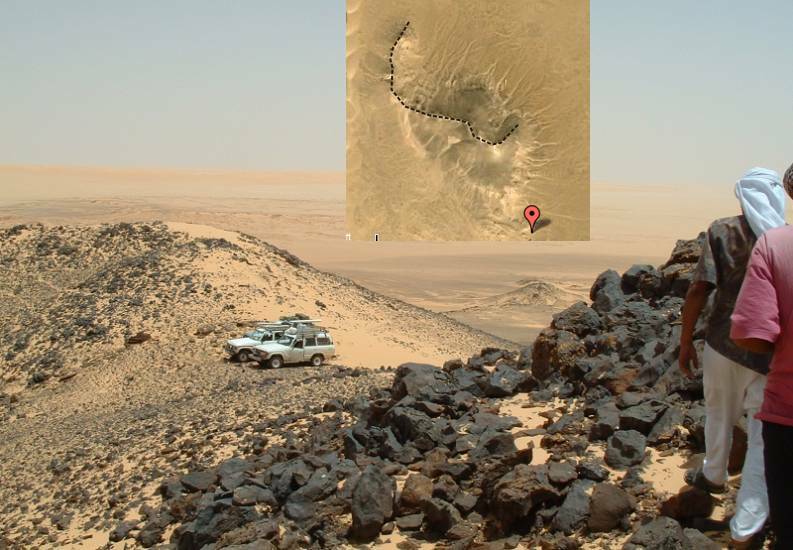 Very interesting in this context are the finds of relocated Al-rich "Dakhla Glass" in a paleo-lake. It contains a considerable amount of pyroxenes and is an andesitic lava due to its composition. 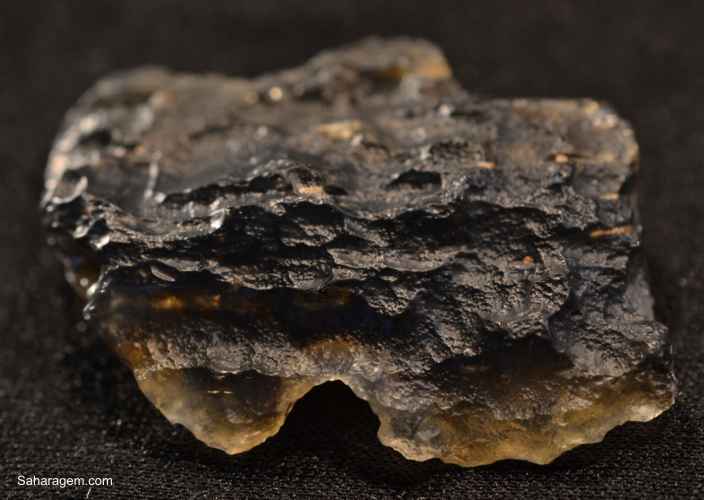 The root of initially fluide amorphous Silica (lechatelierite), with melt temperatures of about 1800°C or more, could be a gabbroide magma plume. The findings of "sub-micrometer diamonds in an amorphous, carbon-dominated matrix" are a clear indication for the origin of the Silica from enomous hypabyssal depths. The presence of high-temperature minerals of quartz, as well as baddeleyite, a high-temperature breakdown product of zircon document temperatures in a slowly ascending and down-cooling initally silica solution. The digestion of high-temperature mineral silica phases up to the stage of formation of lower temperature alpha-cristobalite indicates a constantly progressive cooling of the mass. It is well possible, that a SiO2-rich solution have climbed the earth's surface along the main-fault of the Uweinat-Howar Uplift. SiO2-rich fluide amophous mass have separated themselves from the magma body with a amount of supercritical water. This supercritical water will then continuously separate from the melt at lower temperature (374°C, pressure 22GPa). 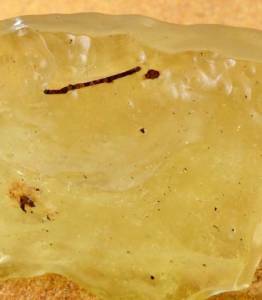 The SiO2-rich mass will than consolidated consequently (with loss of water) to an gel of pure natural glass. Special flow marks in the glass speak for a flow of the mass at the earth's surface like slow-moving lava. Resume: The LDG is according the mid-infrared reflectance an unique low-water silica fluid (opaline glass/ hyalite). 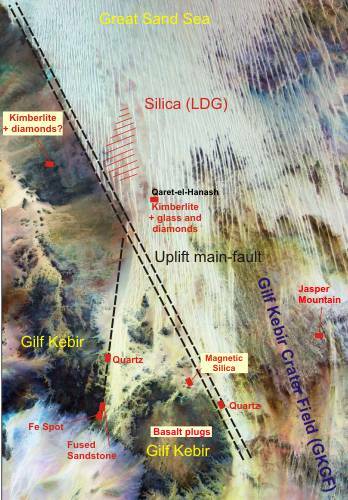 Remarkable are polygonalized graphite ribbons and Al-rich pyroxene phenocrysts in the groundmass (see publications below) what indicate the origin from enormous deeps. 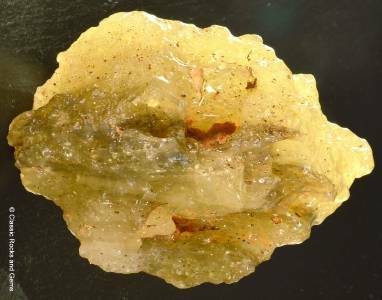 "Opal-AN is opaline silica that is deposited in thin otryoidal crusts on volcanic rocks by quenching from high temperature silica fluids. 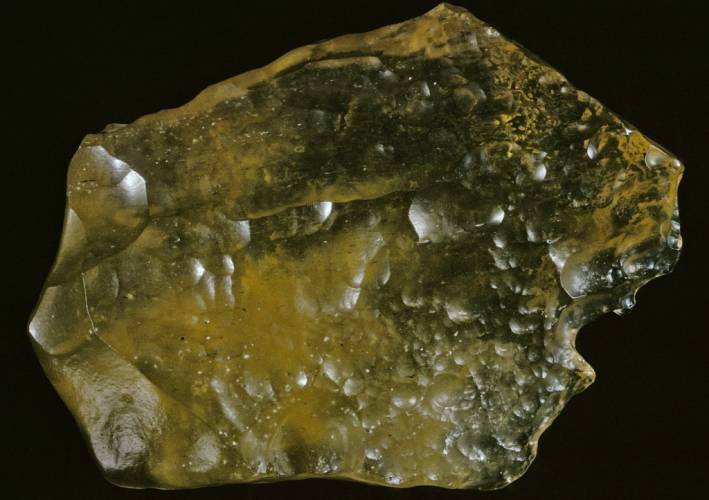 Opal-AN, although a natural hydrous silica, has a much lower water content that opal-AG and has properties that are much more akin to silica glasses. 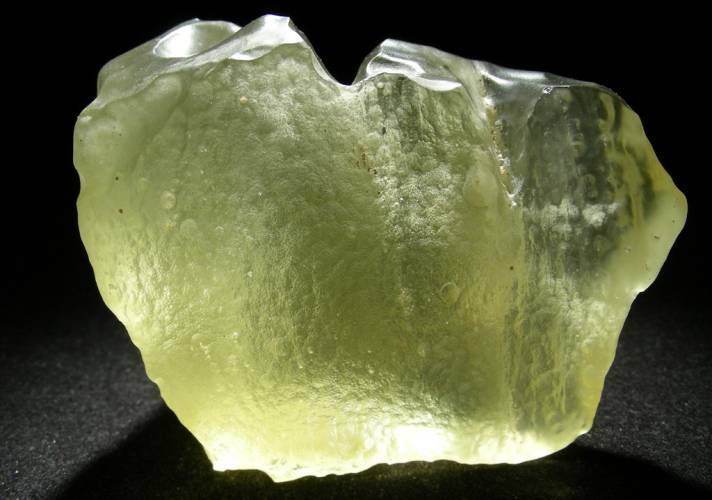 Examples of this type of silica are hyalite or Libyan Desert Glass." 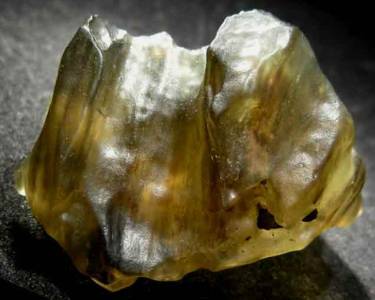 "I have master references of some volcanic and "impact" glasses as well of the Libyan Desert Glass (LDG) from the mid-infrared reflectance (Magna 560 spectrometer). The result is that the LDG is not glass, not agate, opal, or jasper. 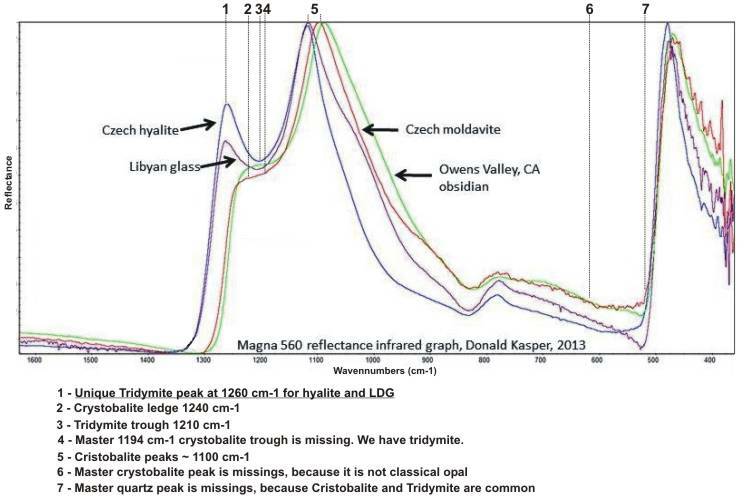 It does, however, very precisely match hyalite in infrared (right). 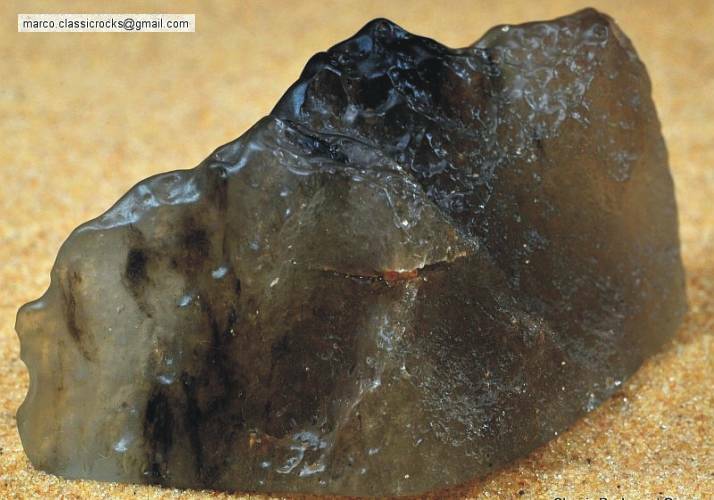 Volcanic glass (obsidian etc.) alleged impact glass, tektites - all the glass and tektites match volcanic rocks. For proper volcanic identification, first we have to see a suite of additional 1200 cm region spectral bands not found in the literature due to the limitations of using transmission infrared instead of reflectance used here. The LDG is a vapor-deposition of silica in volcanics. 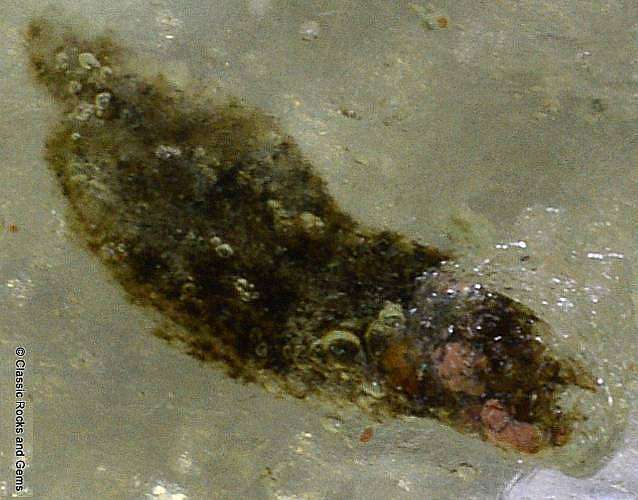 The comparison hyalite specimen coming from the Czech Republic. The hyalite is a glass-like opal, usually found associated with volcanic rocks, has characteristics different from other types of opal." The spherules generally occur as distinct single objects; only rarely two or more are found in close proximity to each other. They are separated from LDG matrix by concentric cracks and contain a high density of internal cracks, which do not extend into the surrounding glass. Sometimes these cracks are curved and delimit rounded subgrains resembling some features of ballen silica, although the rounding of subgrains is not as regular as normally observed in ballen silica. 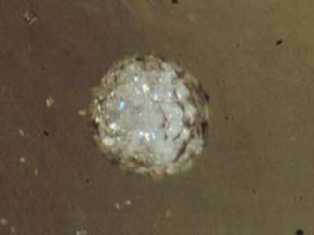 Tiny bubbles are abundant in the spherules and cause partial brownish staining. Viewed with cross polarized light, the spherules appear completely birefringent and show pronounced twin lamellae. Electron microprobe analyses indicate that the spherules have, on average, higher SiO2 (approximately 99.8 wt%) and lower major oxide concentrations (e.g., Al2O3, MgO, FeO, and TiO2) than the surrounding LDG glass. Accordingly, they appear slightly darker in BSE images compared to LDG matrix. Raman spectra recorded on various spherules show pronounced peaks at 230 and 418 cm-1 and smaller peaks at 780 and 1076 cm-1, which are diagnostic for alpha-cristobalite. In some spectra the peak at 780 cm-1 is shifted to 793 cm-1, which might be attributed to the intense twinning." "Brownish inclusions are irregularly shaped, elongated objects that exhibit smooth contacts to the surrounding glass, with schlieren extending from the inclusions into the glass matrix. Optical microscopy reveals that the inclusions are composed of numerous very small bubbles causing the brownish color and of subrounded to rounded mineral grains displaying higher refractive indices than the surrounding glass. While some of these phases appear as small roundish to elliptical droplets, a few larger and more angular grains exist. Generally, all phases within the inclusions appear isotropic when viewed under cross polarized light. Electron microprobe analysis revealed that angular grains and droplets have very similar chemical compositions. 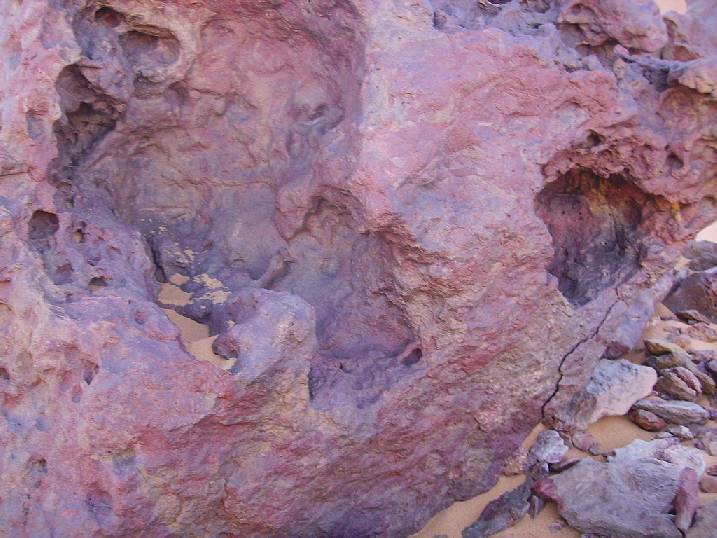 All these phases contain considerable amounts of silica (approximately 53–54 wt% SiO2) with approximately 5–6 wt% Al2O3, approximately 23–24 wt% MgO, approximately 14–15 wt% FeO, and minor concentrations of TiO2, Cr2 O3, MnO, and CaO. Analyses also indicate poor stoichiometry of the phases attesting to a low degree of crystallinity. These compositions most closely resemble that of an Al-rich orthopyroxene. According to X-ray elemental mapping, the angular grains and droplets are compositionally homogeneous and do not show any chemical zoning. Due to the high porosity of the two birefringent grains, their electron microprobe analyses are also nonstoichiometric and yielded totals between 95.5 and 99.1 wt%. Although containing slightly less Al than the droplets, the overall composition of the birefringent grains closely resembles that of the isotropic grains and droplets. Raman spectra obtained from the different isotropic grains and droplets are characterized by two broad features at approximately 570 and 960 cm-1 attesting to their amorphous nature or very low degree of crystallinity. In contrast, Raman spectra collected from the birefringent grains show several distinct peaks, which are clearly recognizable despite a strong fluorescence. The most prominent Raman bands are found at ~340, ~385, ~464, ~655, ~674, ~839, ~935, and ~1001 cm-1. 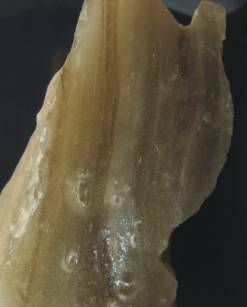 According to systematic Raman studies of pyroxenes, these bands, especially the splitting of the doublet in the 650–680 cm-1 region, are typical for orthopyroxene. 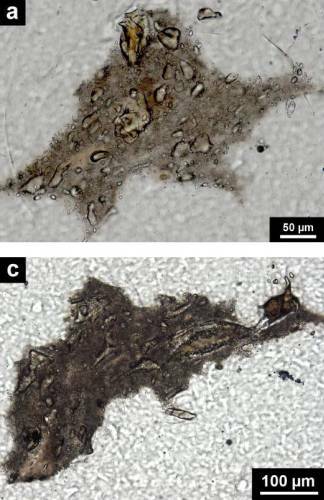 Compositions and Raman spectra clearly indicate that all pyroxene-like phases observed in the brownish inclusions were at least partially molten....and that no low-Ca, Al-rich pyroxene phenocrysts are present in the glassy groundmass. Hence, the pyroxene-like phases are clearly not co-genetic." * Pyroxenes occur dominantly in rocks formed under high ambient pressure, e.g., in a hypersthene-cordierite-biotite granulite, in granulite xenoliths from the lower continental crust, and in a bronzite from a high-pressure megacryst in an alkaline lava. 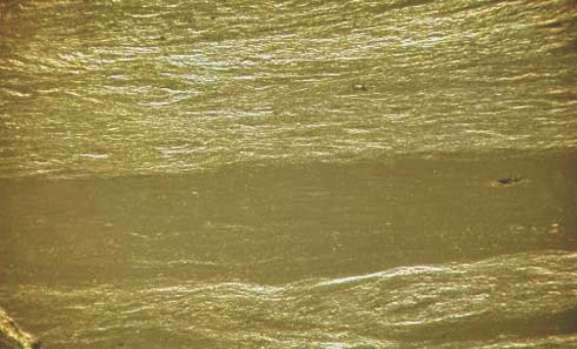 "The dark streaks investigated in this study appear as 0.3 to about 1 mm wide wavy bands that continue for about 1–3 cm almost parallel within the light greenish glass fragment. 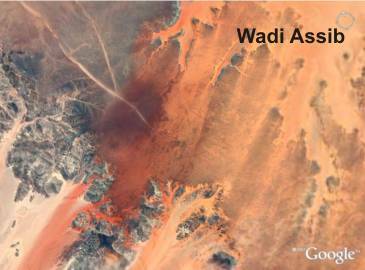 Intensity of the brownish staining varies locally from weak to strong over several millimeters. Optical microscopy revealed that these bands resemble turbulent flow structures that do not contain any discernable mineral phases at the millimeter scale. 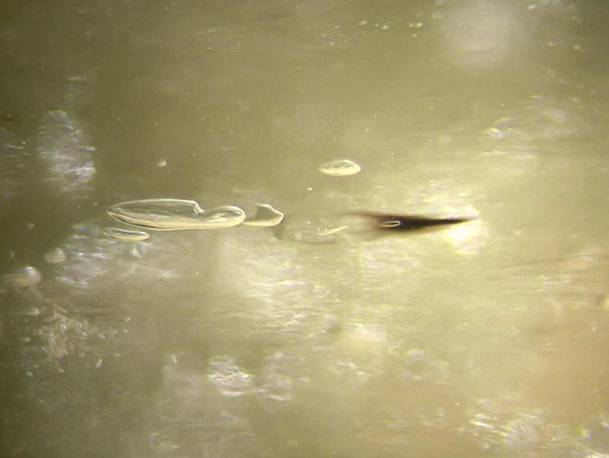 Differently shaped bubbles are quite abundant within the streaks and sometimes appear as nucleation sites for the bands. In high contrast BSE images the streaks are clearly discernable and appear as curved, variably gray-colored bands or as lenticular regions with pronounced flow textures. Electron microprobe analyses and X-ray elemental mapping of several regions within streaks show a strongly heterogeneous distribution of Al, Si, Mg, and––more rarely and less pronounced––of Fe and Ti. Generally, the Si-rich regions appear darker in BSE imaging, whereas those with higher Al and Mg contents are brighter. Variations in Al abundances allow tracking the flow structures observed in BSE mode. The Micro-XRF mapping clearly shows enrichments and good correlation of the abundances of Mn, Cr, Fe, and Ni in the dark streaks. The Ti-distribution also shows pronounced schlieren structures, which appear, however, not related to the Fe maximum intensity. The Zr distribution map shows the presence of distinct Zr-rich spots, probably zircon or baddeleyite. The concentrations of the elements Cr, Mn, and Ni were extrapolated using the linear correlation of peak intensity and element concentration determined in different standards and should be taken as semi-quantitative. The concentrations for dark and light areas, respectively, are for Ti 920 and 780 ppm and for Fe 4900 and 1160 ppm. In the dark streaks the concentration of Cr is 170 ppm, that for Mn 74 ppm, and for Ni 80 ppm; the concentrations of these elements are below the detection limit in the light regions. 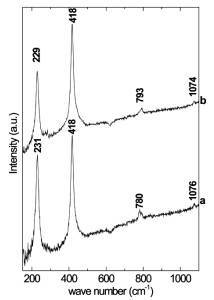 Raman spectra recorded from the dark streaks are featureless and confirm that no crystalline phase is present in the bands." 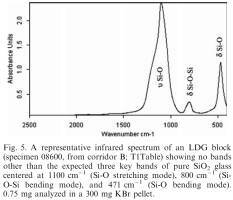 "All of LDG IR spectra exhibit the three IR active absorption bands typical for condensed (SiO4) tetrahedra that are predicted by theoretical considerations. The bands near 1100 and 471 cm-1 are assigned to degenerated vibration modes of the (SiO4) tetrahedral unit, respectively, stretching (n Si-O) and bending (d Si-O) (Lecomte 1949). The n Si-O band is quite stable at 471–472 cm-1 for amorphous phases. The wave number of the m Si-O band is affected by the surroundings of the unit tetrahedron (Lecomte 1949); for crystalline silica phases (e.g., quartz, cristobalite, opal-CT), it is regarded as the envelope of several, poorly resolved bands; then delta n and I are less significant than for amorphous phases. 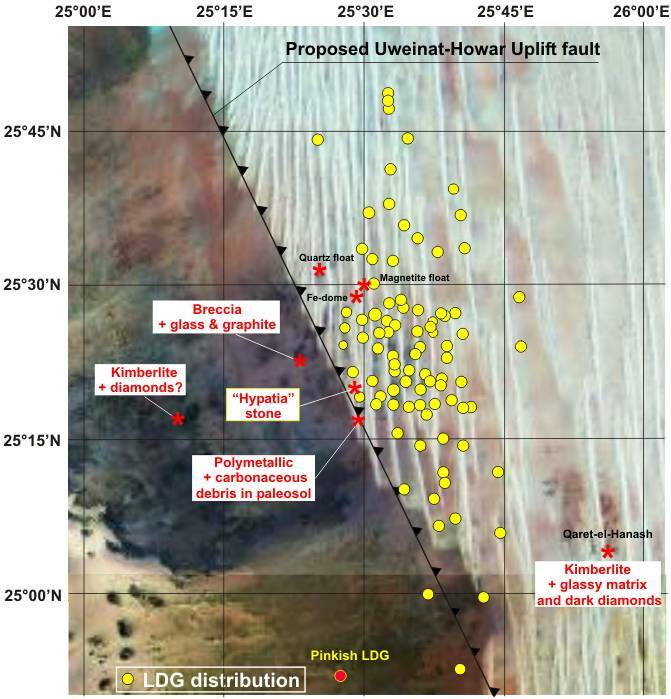 For LDG samples and fulgurite, the wave number of this band is not very variable around 1103 cm-1, whereas the wave number values for fused quartz and amorphous biogenic silica are lower, respectively, 1101 and 1100 cm-1. The absorbance, the half-width, and the integrated intensity vary rather widely, whereas they are stable for crystalline phases. The third, weaker band, near 800 cm-1, is assigned to a vibration of the bridging oxygen atom in the plane of the Si-O-Si bonds, between the adjacent tetrahedra (Lecomte 1949). The relative motion results in a deformation of the Si-O-Si angle in the direction of its bissectrix (Parke 1974)." 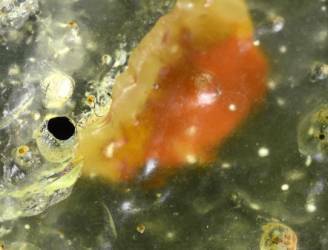 "In polished thin sections, LDG appears as a homogeneous glass with spherical bubbles and mainly tubular cavities. Sometimes they are at least partly filled with sand grains and/or hardened silt. The millimeter-sized (and smaller) whitish polycrystalline spherical inclusions visible inside the LDG volume were identified by FTIR (and also by Raman spectroscopy) as cristobalite concentrations. Other mineral inclusions were detected by SEM in BSE mode (backscattered electrons) and determined by EDS. These included melted crystals (deduced on the basis of their elliptical form) of monazite, a rare earth element (REE) phosphate depleted or totally lacking in phosphorus as seen on their EDS spectra, according to the three domains analyzed (in wt%: Al = 0.2–0.8%, Si = 15.0–26.0%, O = 36.2–37.0%, P = <0.1–9.0%, Ca = <0.1–0.4%, La = 8.4–9.9%, Ce = 14.0–16.9%, Pr = <0.1–1.6%, Nd = 5.9–6.5%, Sm = <0.1–1.0%, Gd = <0.1–0.8%, Th = 3.8–5.8%), and zircon (ZrSiO4) transformed into a mixture of baddeleyite (ZrO2) and lechatelierite; both of these mineralogical processes require great heating." 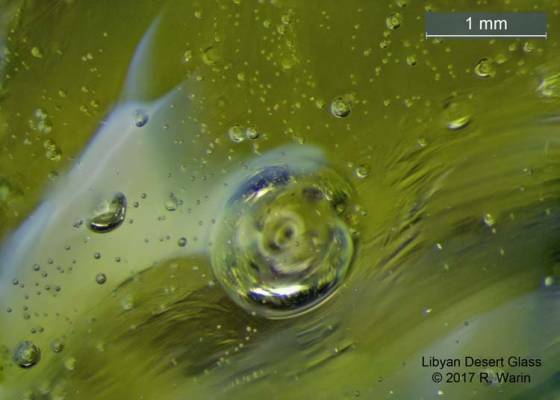 "Samples of Libyan Desert Glass were analyzed by X-ray micro-diffraction technique. It was identified fourteen nano-sized crystalline LDG phases with different colours: Coesite, tridymite, stishovite, baddeleyite, huttonite, yttrium, moissanite, platinium, polymorphs of diamond and graphite. The four praphite polymorh phases found in LDG samples can be explained by taking into account that the graphite came from the earlier history of the material. The element platinum is extremely scarce in most crustal rocks. The origin of platinum is from ultra-mafic igneous rocks. Its melting point is 1775 °C. 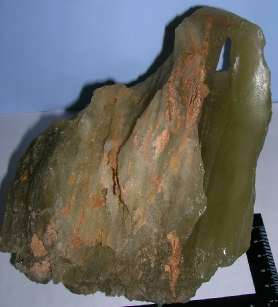 The zircon oxide mineral Baddeleyite is the product of the decomposition of zircon at 1775° - 1900°C. Moissanite is a natural silicon carbide (SiC). 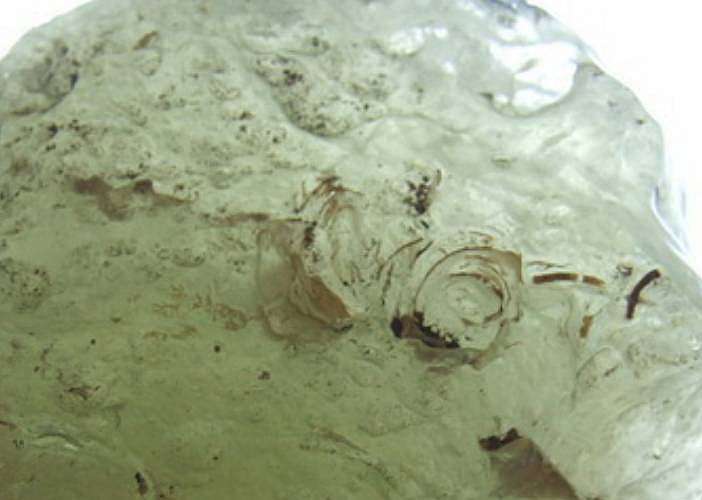 Huttonite is a low-temperature and low-pressure Thorite-polymorph (ThSiO2). The identification of nine highbaric phases, the presence of hexagonal diamond with four phases of graphite polymorphs, as well as huttonite and baddeleyite, confirm that LDG formed by "shock metamorphism" at very high pressure and temperature. The nano-sized crystalline phases revealed point out that LDG rapidly solidified. Preliminary X-ray micro-diffractometry analyses were presented at the “Silica 96” workshop (Patuelli, 1997). High pressure and high temperature phases were identified: including samarium, germanium 12T, thorium beta (this beta phase occurs only at a temperature above 1350°C) and stishovite, which is a high temperature and pressure form of SiO2." 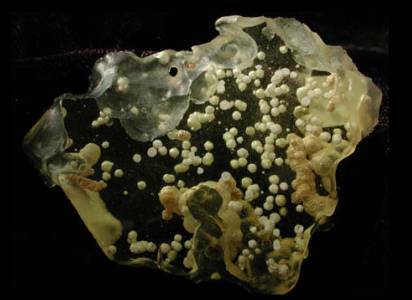 "Transmission electron microscopic (TEM) investigation of the dark (brown or bluish) streaks occurring in Libyan Desert Glass reveals the common presence of small glass spherules. 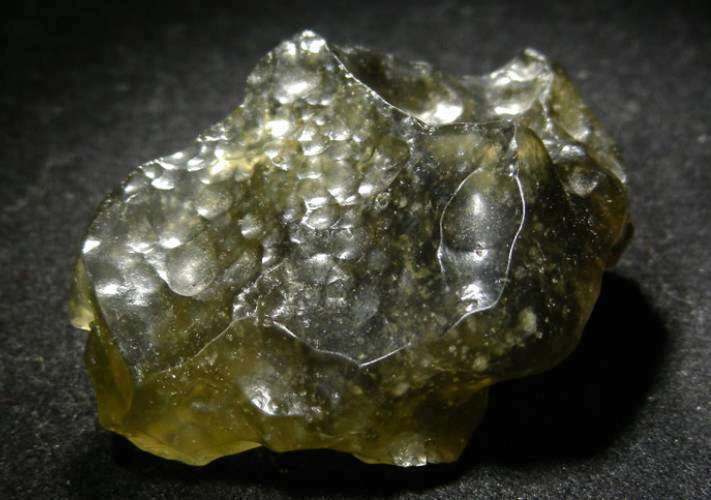 The spherules, mostly 100 nm in size, are homogeneously dispersed within the silica-glass matrix. The complete absence of electron diffraction effects confirms their amorphous nature. The spherules are Al-, Fe- and Mg-enriched with respect to the surrounding silica matrix and their (Mg+Al+Fe) : Si ratio is close to 1. 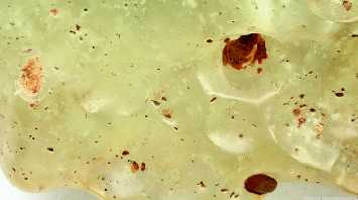 The silica-glass matrix and amorphous spherules form an emulsion texture (i.e., globules of one glass in a matrix of another glass), which originates from silicate-silicate liquid immiscibility. The silica glass also contains carbonaceous inclusions consisting of 5–50 nm thick, polygonalized graphite ribbons that form closed structures up to 200 nm in diameter. 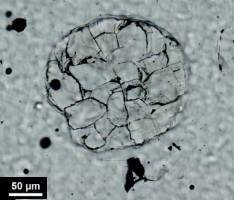 Rare carbon-bearing inclusions randomly occur within the silica-glass matrix. Their presence is ubiquitous and not limited to the regions with dark streaks. C-bearing inclusions produce an evident C peak in the EDS spectra. 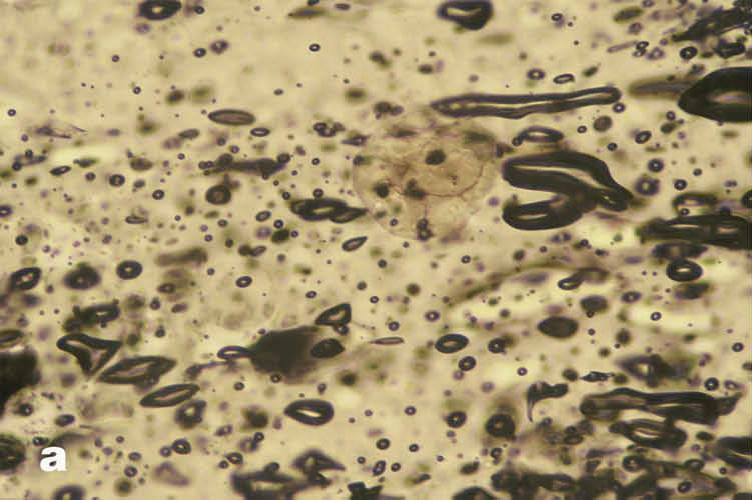 The inclusions consist of ring-shaped polygonalized ribbons, 5–50 nm thick, typically forming closed structures with an overall diameter of ~200 nm. Their SAED patterns consist of rings with d-spacings of 3.35, 2.09 and 1.67 A: these values correspond to graphite (3.36, 2.13-2.03, 1.678 A, JCPDS 23-64). Lattice imaging shows 3.35 A polygonized (002) lattice fringes. The fringes are quite regular, thus indicating good structural order with no evidence of deformation or defects. Dark vertical bands are evident at the polygonal edges and are interpreted as Moire textures." 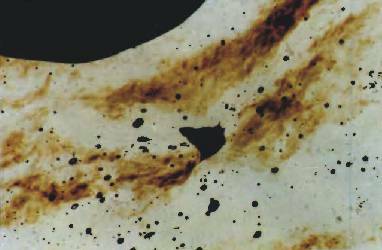 "In this study we have focused on the chemical and textural characteristics of dark schlieren. Our investigation aims at obtaining further information on the cooling history and precursor material of LDG. Backscattered electron (BSE) images were taken on the SEM and microprobe in order to monitor chemical variations in LDG and to detect tiny inclusions. Schlieren-free, bulk LDG samples show only slight variations in chemistry, with two different grayscales in BSE images. 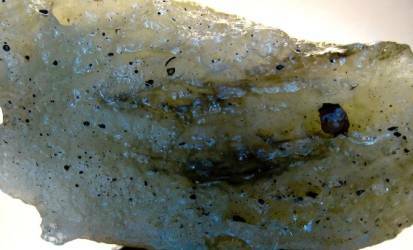 Dark grey, lens-like areas consist of almost pure SiO2 and thus represent lechatelierite, the melt product of quartz. Bright grey areas have on average a SiO2 content of 98 – 99 wt.%; additional minor elements are Mg, Fe, Al, Ca, K, and Na. Compared to the bulk glass, the brownish-black schlieren in LDG are distinctly enriched in Mg, Fe, and Al; the concentrations of measured trace elements such as Ti, Ni, Cr, and La are equally enhanced. In some parts of schlieren the SiO2 content decreases down to 86 wt %. Within the dark schlieren we observe furthermore distinctly larger chemical variations than in the bulk glass sample. 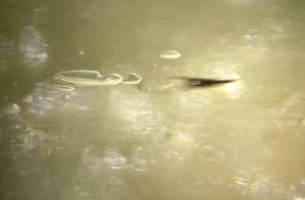 BSE images indicate that there are two types of dark schlieren. One type of dark schlieren consists exclusively of tiny, mostly 100 nm in size, glass spherules. This type of schlieren have been previously described in a transmission electron microscopy study, as well. 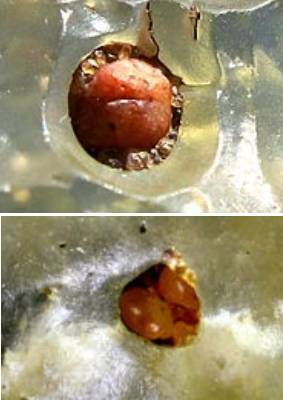 In comparison to the glass matrix, the spherules are enriched in Al, Fe, Mg, and Ni and depleted in Ca. The other type of dark schlieren displays flow structures and large, up to 25 μm diameter glass spherules. The overall texture of these schlieren indicates an immiscibility of two silicate liquids. To detect the miscibility gap, the chemical compositions of spherules and the surrounding groundmass in dark schlieren have been measured with the microprobe and are plotted in a ternary MgO-Al2O3-SiO2 diagram. The analytical data define a trend that deviates from the known stable miscibility gap along the MgO-SiO2 join. Instead, the data points follow closely the Al2O3-SiO2 tie line, along which a metastabile miscibility gap has been described. 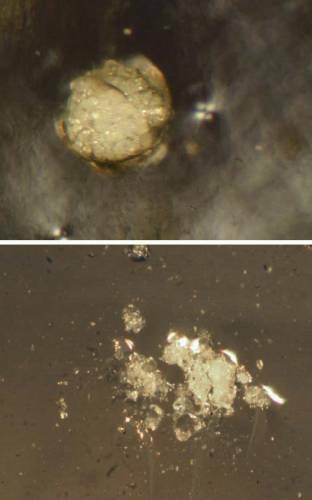 Microprobe analyses of spherules and ground-mass in dark schlieren of LDG. The ternary plot shows also the known stable miscibility gap along the MgO-SiO2 join. LDG samples with and without black schlieren were stepwisely heated up to 1450°C. In both samples, bursting bubbles released mostly H2O and CO2. The black schlieren contain however one order of magnitude more H2O and CO2 than the bulk silica glass. Another difference between black schlieren and bulk glass concerns the temperatures of gas release. For example, CO2 is released from black schlieren in two temperature intervals between 250° - 300°C and 450° - 550°C. In the bulk sample, CO2 is however only liberated in the upper temperature interval between 420° - 650°C. The data presented here provide hints to the cooling history of LDG and the precursor material of dark schlieren. Microprobe data of glass spherules and surrounding matrix in dark schlieren indicate that the compositions of the two immiscible silicate liquids are close to the Al2O3-SiO2 join. According to experimental studies, this binary system displays only metastable immiscibility for very rapid cooling of the melt, as it is expected for LDG. DEGAS analyses reveal that dark schlieren are distinctly richer in volatiles, particularly in H2O, than bulk LDG. 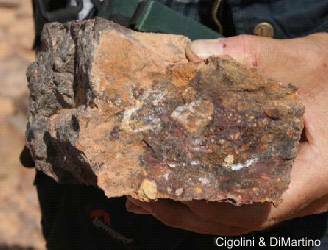 It is thus likely that the precursor material might have contained hydrous phases." 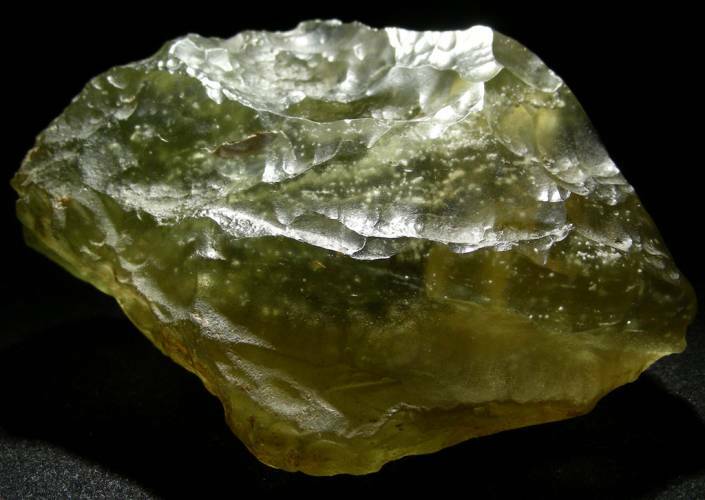 "Several specimens of Libyan Desert Glass (LDG), an enigmatic natural glass from Egypt, were subjected to investigation by micro-Raman spectroscopy. 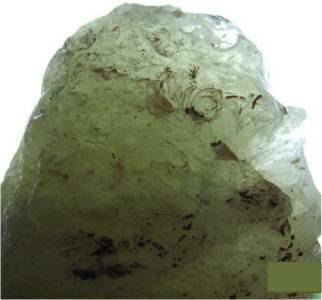 The spectra of inclusions inside the LDG samples were successfully measured through the layers of glass and the mineral species were identified on this basis. The presence of cristobalite as typical for high-temperature melt products was confirmed, together with co-existing quartz. TiO2 was determined in two polymorphic species, rutile and anatase. Micro- Raman spectroscopy proved also the presence of minerals unusual for high-temperature glasses such as anhydrite and aragonite. As it was mentioned before, MRS is very convenient to analyse inclusions in transparent samples without damaging them. First we measured Raman activity of glassy matrix. The Raman band marked with a red arrow (Fig. 2) should be emphasised, hence this sharp (although not intense) peak would indicate the presence of fullerene. It was a small black spot deep under the surface; however we managed to record the spectrum. Although it seemed quite incredible for us that fullerenes could be found inside LDG, it has already been mentioned in the literature. Figs. 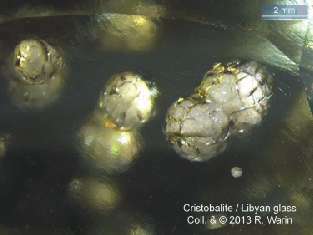 3 to 8 present the other inclusions analysed by MRS. Cristobalite is the silica form most often reported as a component of LDG. 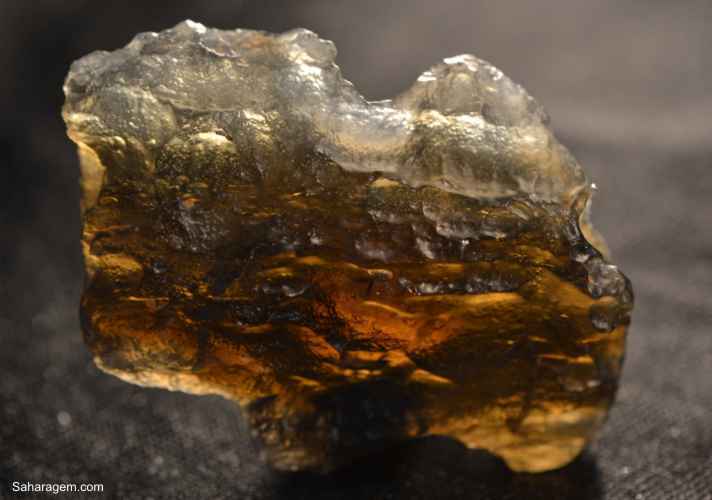 It is widely assumed that its presence proves the temperature of glass quenching as above 1470°C. The shape of cristobalite inclusion presented in Fig. 3 is typical for LDG, with an almost ideally spherical form. However, we also found cristobalite as crushed, irregularly shaped inclusions (Fig. 3). Moreover, its Raman spectrum is fairly disturbed by luminescence, probably due to a presence of transition metals or REE. As for other polymorphs of silica, tridymite is stable below 1470°C and above 870°C, while quartz – below 870°. However, the presence of one form does not exclude the other one, which is clearly shown in Fig. 4. The Raman spectrum gives an undeniable confirmation of quartz being present in LDG; the question remains whether it is a primary or secondary mineral. In a cristobalite structure, each SiO4 tetrahedron shares its oxygen atoms with adjacent tetrahedra; how likely it is then to convert cristobalite into quartz within 29 million years? A similar system of two TiO2 polymorphs is presented in Fig. 5 and Fig. 6. 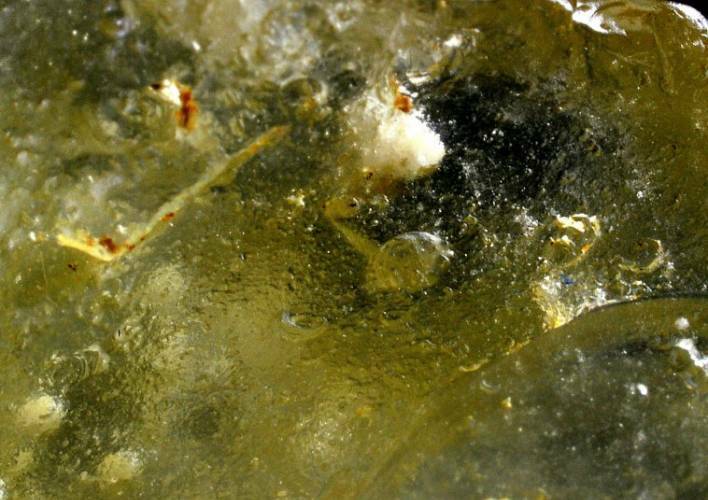 Rutile is a common accessory mineral formed in high-temperature and high-pressure metamorphic rocks. Anatase (and brookite) are less stable and revert to rutile at low temperatures (anatase at 915°C and brookite at 750°C). 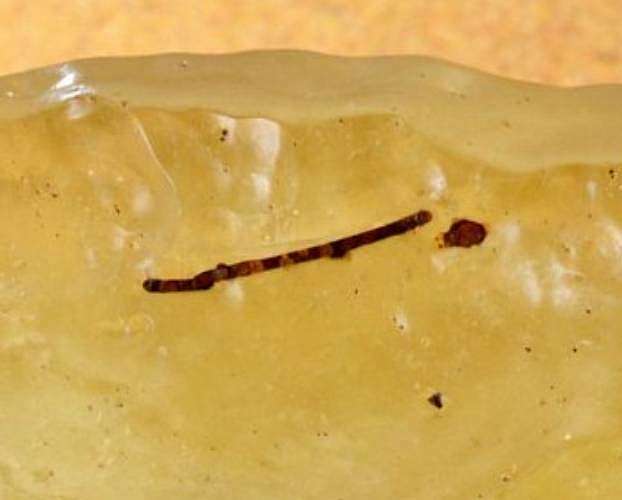 Considering that both rutile and anatase can be found as LDG inclusions, it leads to a doubt whether the temperature of cooling down was indeed so extremely high. The spectrum shown in Fig. 6 belongs to zircon – a mineral also recognized as inclusion of LDG, however more often as a precursor of baddeleite (ZrO2), which is a product of thermal decomposition of ZrSiO4. In our investigation we didn't find any traces of baddeleite, but we definitely confirmed the presence of zircon, which would speak in favour of rather low or medium temperature of quenching. The inclusion in Fig. 7 was quite surprising as well. It is composed of at least two different phases – the white one, which MRS spectrum was only a big fluorescence hump, and the brownish one, which apparently contains amorphous carbon. MRS spectra in Fig. 7 represent different spots within the brown area. 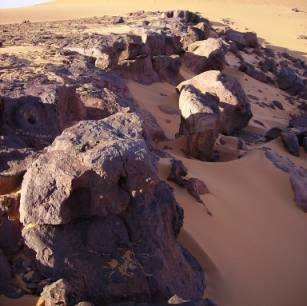 The two characteristic D and G band shape proves doubtlessly that carbon was there, but it doesn't give any explanation how organic matter could be preserved in hot molten silica." Macroscopically analyzed LDG are translucent glassy matrix with brownish spherical inclusions located all over the external surface before slicing. However, after the lamination of the samples, it could be observed that in the inner part the brownish inclusions were not discerned, whereas whitish inclusions could be easily perceived. 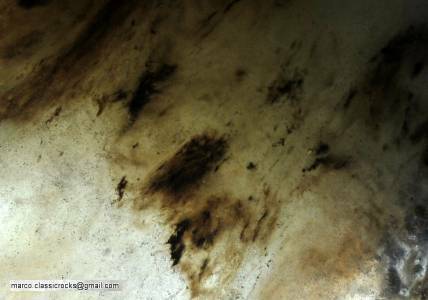 Microscopically, it could be noticed little dark inclusions. 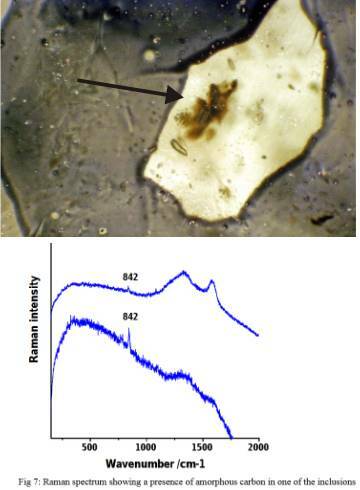 Raman spectroscopy allows determining the mineral phases of the inclusions. Comparing the results obtained from the inclusions of the surface and those obtained from the inner inclusions, it could be noticed important differences. 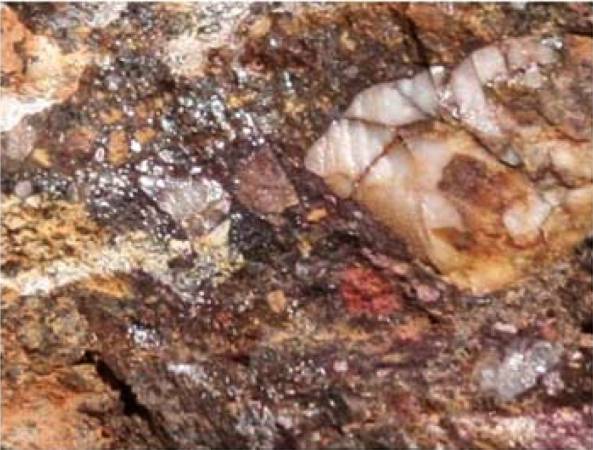 Apart from the silica mineral phases such as cristobalite and quartz, other minerals were found in the inclusions distributed through the matrix of the LDG. In the inclusions located on the surface of the samples iron compounds were not detected, whereas they are the main component of the inner ones. In contrast, compound such as corundum is only present at the surface. Besides, they were identified mineral characteristic phases of the LDG (high pressure) and of LDG settled state (low pressure). 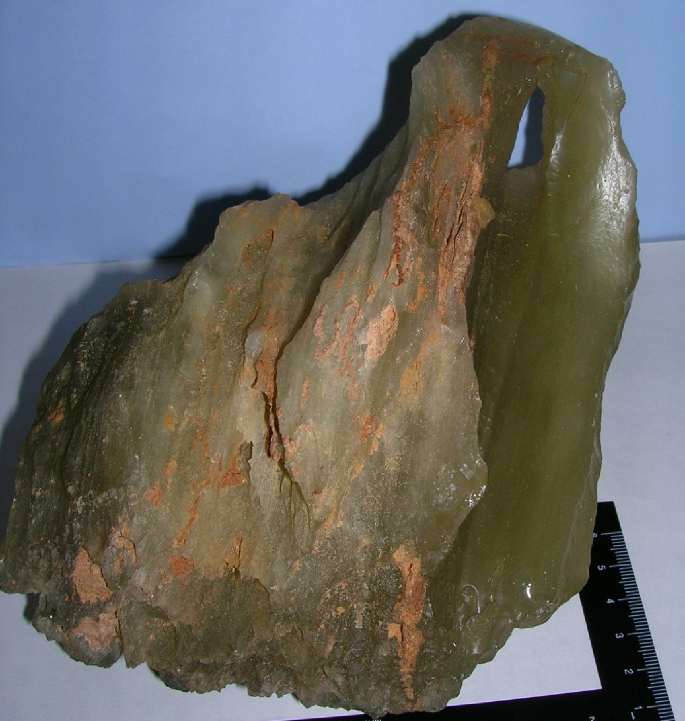 The presence of calcite suggests a possible transformation of high pressure aragonite to the low pressure calcite both detected in the present study. Other couples of minerals similar in composition are also detected. In this way, sulphates as anhydrite and gypsum were detected. Anhydrite corresponds to the anhydrous phase of gypsum. 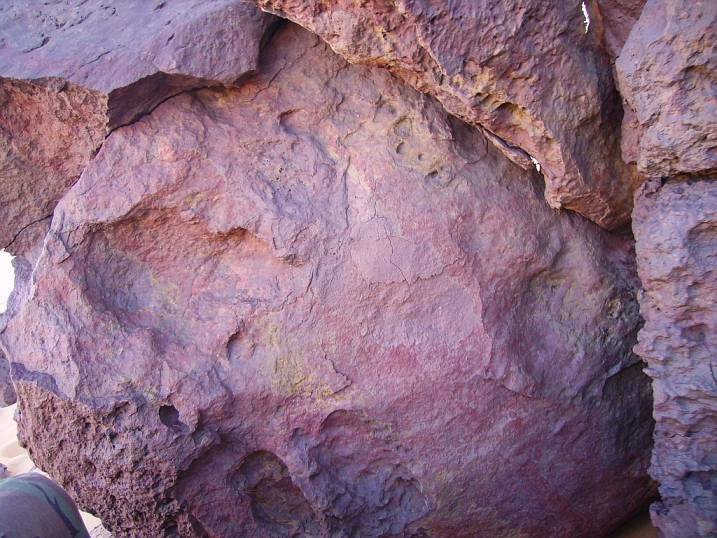 During weathering, hematite can be transformed into a mixture of hydrated iron oxide-hydroxide known as limonite. 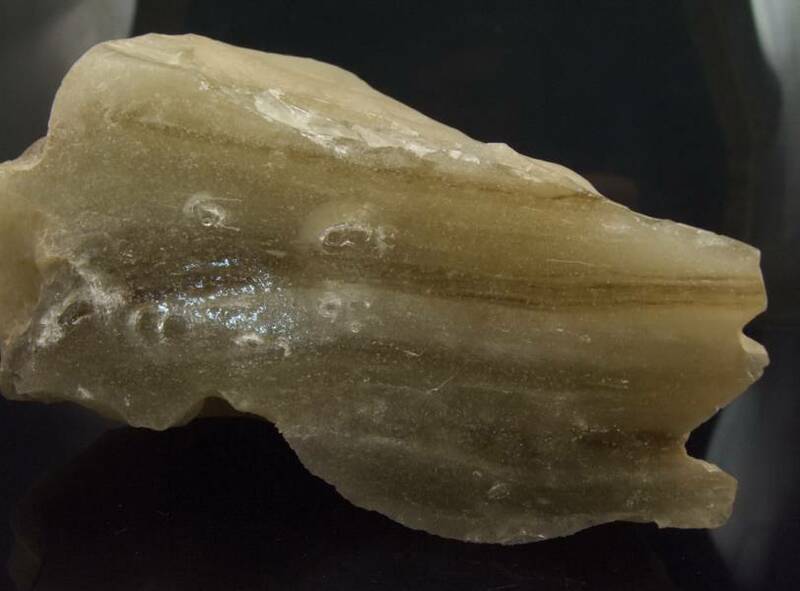 In the case of silicates, the identified cristobalite could be formed during high temperature, since it is a hightemperature mineral; in contrast quartz is the cristobalite low-temperature polymorph. 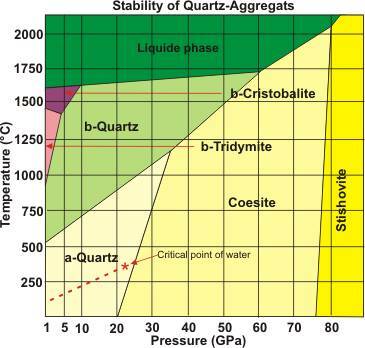 High temperature mineral phases such as microcline and anatase were distinguished. By Raman spectroscopy respective low temperature polymorphs were not found. 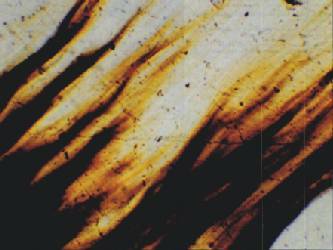 However, by optical microscopy of fine rutile microlites can be observed. This phase can correspond to the transition of the anatase with high temperature. In order to complement the previous results it was carried out an element mapping using SEM-EDS. In this way it could be seen how the elements are distributed in the inclusions. In Fig. 1 the first image is corresponded with the SEM image of an inclusion of LDG. The other images are elemental maps done with EDS over the same inclusion. In those maps, the white colour represents the presence of an element and the black the absence. It can be seen that the inclusions are not formed by only one compound. The inclusion analyzed in the image, around the big cavity, is composed mainly by silicon but some elements are concentrated in certain areas, such as: C, O, Mg, Al, K, Ca, Ti and Fe. On the one hand, calcium and carbon maps are very similar. The place where the carbon and the calcium are more concentrated is the same. 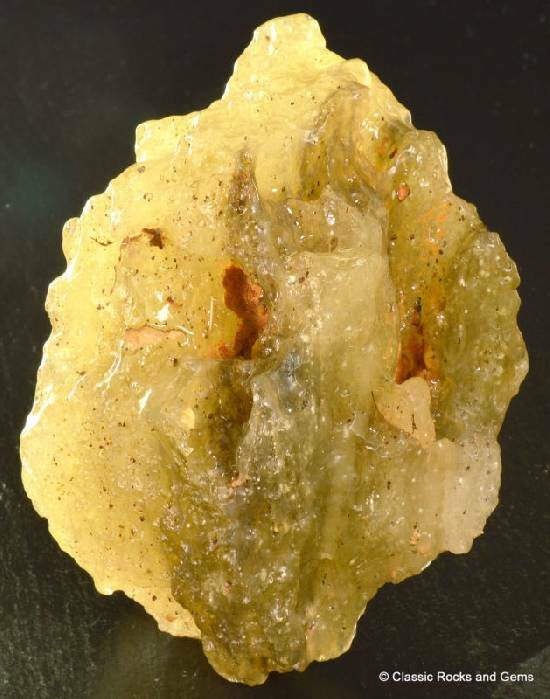 This fact supports the presence of calcite and/or aragonite, both determined by Raman. On the other hand, silicon, iron and aluminium compounds appear similarly place and are in concordance the mineralogy detected by Raman spectroscopy. This chemical and mineralogical heterogeneity was observed in all the analyzed samples. 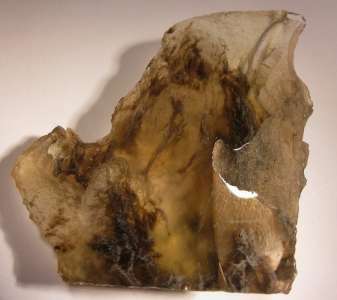 This work is an approach to the knowledge of the origin of the Libyan Desert Glass. It can be concluded that the silica is the main component in LDG glassy matrix. Inclusions are composed by different compounds and therefore are chemically more heterogeneous."